For a very long time, the name Ohanaeze Ndigbo has been a known name in Igboland which is made up of old men on red caps who have vowed to consistently work against the good will and wish of the Biafran people. Right from the time the group was formed, it has remained a willing tool in the hand of the Nigerian government in the advancement of their evil intentions against the people of the East. They have become a pain and agony to Igbos and Biafrans at large due to their actions which is always geared towards supporting and doing the biddings of the North as against the wish of their own people. Ohaneze Ndigbo as the name imply was formed to become the mouthpiece of the Igbo people but for reasons best known to them, the body has been working against the Biafran people and is not actually representing the people as is. Ohaneze Ndigbo by their open and covert actions has become a curse to their own people, of which in their own selfish thoughts, said they are representing the people but in the right sense of it, they do not have the interest of those they said they are representing at heart. On several occasions they have connived with the HausaFulani hegemony to Lord over and above their own people just to satisfy the interest of their paid masters up North. The Operation Python Dance that was unleashed on Biafrans and the unwarranted invasion of the Royal palace of Igwe Israel Okwu Kanu, Nnamdi Kanu's home at Afara ukwu Ibeku, in Umuahia province, in which lives were lost, no outrage or condemnation of any sort was put forth by Ohaneze Ndigbo. Now tell me how you will be representing a people, yet you collaborate with the enemies of the people to kill them? Where is the outrage from Ohaneze Ndigbo after that barbaric military operation? 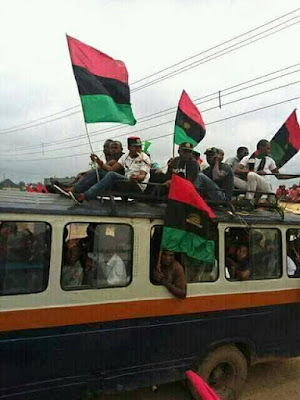 They have vowed not the listen to the cry of the people of Biafra and their quest for freedom. Now that the people you are claiming to be representing have made it clear to you without mincing words that what they want is nothing but Biafra Referendum, yet you continue to clamour for restructuring of Nigeria which even your Hausa Fulani masters have in several occasions rejected. You have chosen to be perpetual slave to the North, that is why you do not want to listen or join hands with your people to make their desire of a sovereign nation a reality. How can a master choose to be a slave to those who are good enough to be his own slaves? How can a land lord choose to be a tenant in his own house? This is very shameful! The elders who are supposed to be at the fore of events in the Biafra struggle for absolute emancipation of a people have chosen to be dragging the people back with their actions because of the crumbs from their masters table up North. However, Ohaneze Ndigbo after collaborating with the enemies of the people to massacre them in their thousands, still have the audacity to fix their restructuring submit in Awka, the heartland of Anambra province in Biafraland as against the wish of the people. How do they think that such program will be allowed to hold? Thank goodness for IPOB who in all ramifications makes sure that they always take a stand on the issue concerning the so called Ohanaeze Ndigbo whenever they want to host any event against the will of our people. That Ohanaeze is even clamouring for restructuring today is because of IPOB. IPOB has opened their eyes to know what they do not know before, yet they do not want to appreciate IPOB. The Biafran people have told Ohaneze Ndigbo that they are no longer part of Nigeria and can never involve themselves in any activities concerning Nigeria again, yet Ohaneze Ndigbo has continued soliciting and clamouring for one Nigeria. Biafrans know what they want and Ohaneze Ndigbo can not decide for them. And on this , IPOB has made it abundantly clear that since they are no more part of Nigeria, there will be no more political gathering of any kind pertaining Nigeria in the whole of Biafraland, be it in the village or city that will be hosted by Ohaneze Ndigbo. Therefore, Ohaneze Ndigbo should either cancel the proposed summit which is scheduled to take place at Awka on the 21st of May 2018 or reschedule it to hold in the North because such gathering will no longer be allowed to hold in Biafraland. The world should know that these sycophants called Ohanaeze Ndigbo are not in any form representing Biafrans.They are only after their selfish interest and their political relevance in Nigeria. They are not after the well being of their people rather they will always go to the Nigerian government collect money and to keep enslaving their own people. Therefore the people have taken their stand that they won't be part of any Restructuring but outright freedom. No Referendum date, No Awka Summit.